On our maiden voyage one of the problems we encountered was in the strong winds I had to constantly work the rudder control to keep us on course. As the rudder control is quite low in profile, I couldn’t get a good grip on it and after a while my hand started to get sore. 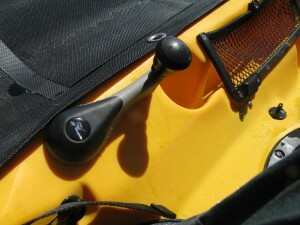 Hobie has a solution to this, it’s called the Hobie Steering Knob. This is a small round knob you screw into the already included nut in the rudder control. This gives you something more substantial to grip when controlling the rudder, especially in strong seas. When I bought the steering knob, Mal at Sunstate Hobie was surprised that I’d had to work the rudder so much to keep her tracking in a straight line, even with the strong winds. He suggested we check there is no slack in the line when we lock the rudder down. If there is slack it’s possible the rudder could rise slightly in fast sailing, which would then contribute to vague steering. On our first trip since installing the knob I have to say it works great. While the winds weren’t strong, the added grip works well in giving you better control. In addition you are no longer relying on just two fingers to control the rudder. This entry was posted in Gear and tagged Tandem Island. Bookmark the permalink.